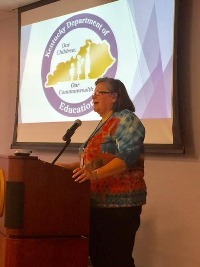 ​The Pennyrile Area Development District serves as a sponsor agency for the Child and Adult Care Food Program ( CACFP). The annual training for Family Day Care Home providers was held at the PADD office on Saturday, September 23, 2017. Elaine Jeff from the Department of Education was the guest speaker and provided program updates which will be effective October 1, 2017. If you are a registered, certified or licensed Family Day Care Home and would like to learn more about the CACFP program and how to participate, please contact Jill Collins at [email protected] or call 270-886-9484.